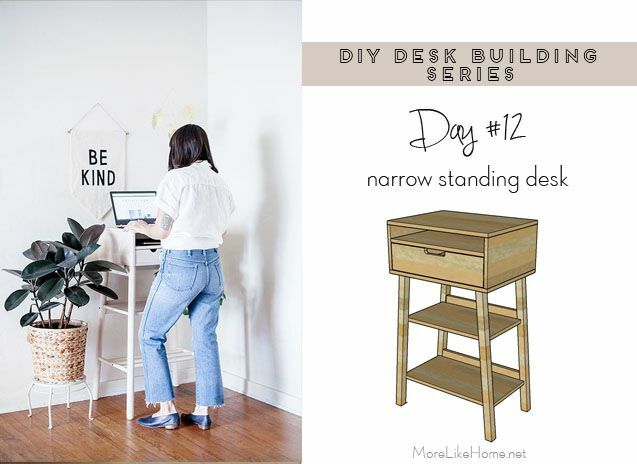 Today's standing desk has a narrow profile that makes it perfect for small spaces (or for anyone who just doesn't need a huge work area). 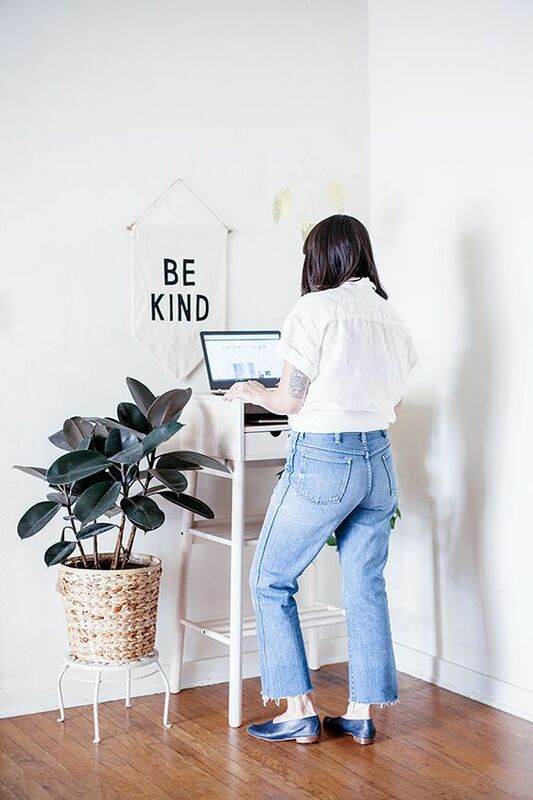 It has built-in storage for a few office necessities, a place to stash your laptop, and open shelving you can dress up to help it blend in with your decor. Start by drilling pocket holes along the top and sides of the back board (A). 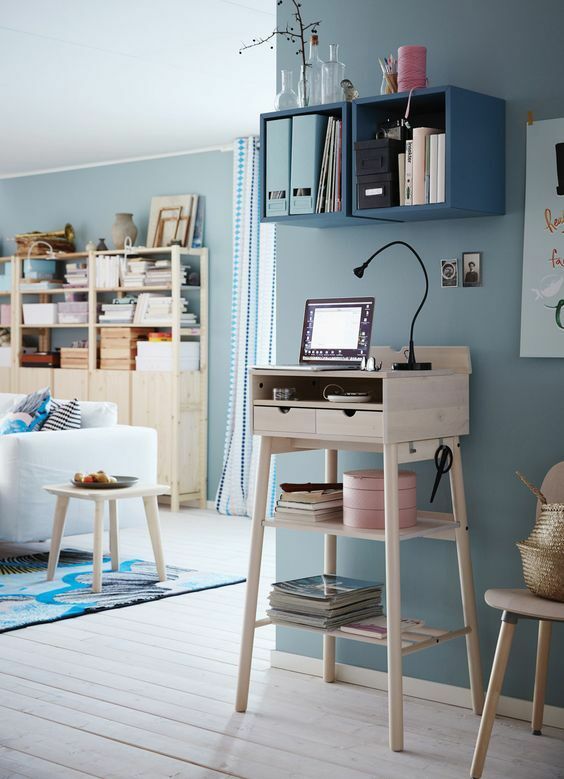 You can also drill a large hole near the top so you can run a power strip or charger into the desk. Then drill pocket holes along the top of the side boards (B). Use the pocket holes along the side of the back board to attach it to the side boards. 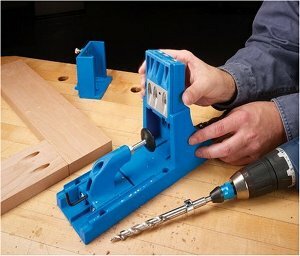 No Kreg Jig? Just drill through the side boards into the ends of the back board with regular wood screws. Use the pocket holes along the top of that frame to attach it to the top board (C) with pocket hole screws. (The bottom board is show in this photo, but don't put it on just yet.) Or drill down through the top board into the sides and back with wood screws. Cut the ends of the legs (E) at a 5 degree angle (parallel /=/). Attach the legs to the bottom board (C). 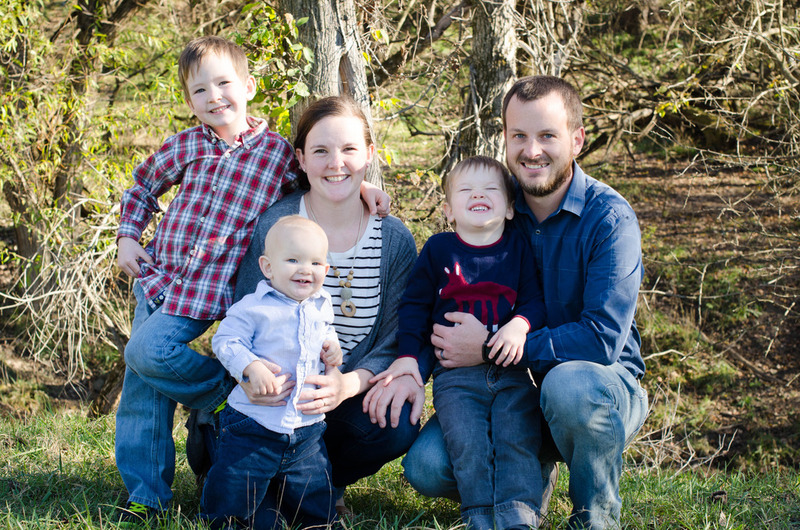 There's a couple ways you can do this. Since we haven't attached the bottom board to the box yet, you can drill down through the bottom board into the ends of the legs. The other option would be to use pocket holes on the front and back of the leg. 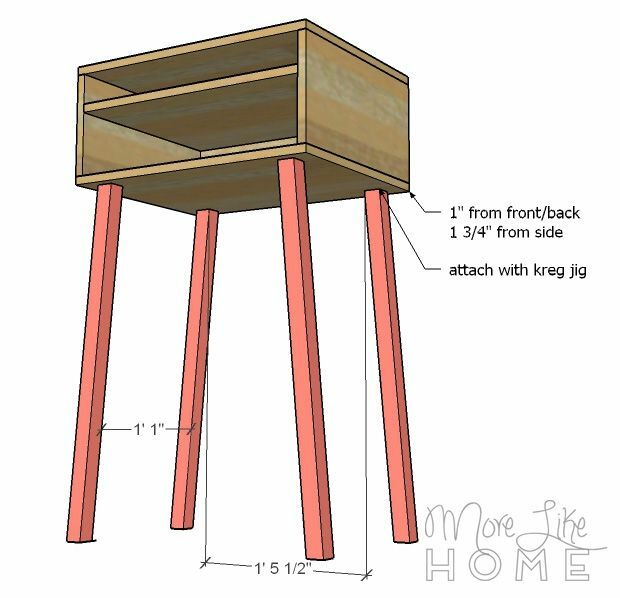 Make sure the legs are set in 1" from the front and back edges, and 1 3/4" from the side edges. This is a good time to have a buddy help keep the legs in place while you attach them. Now you can attach the base with the legs onto the box you built earlier. Just drill through the bottom board into the sides and back of the box with 1 1/4" wood screws. Install the divider (D). 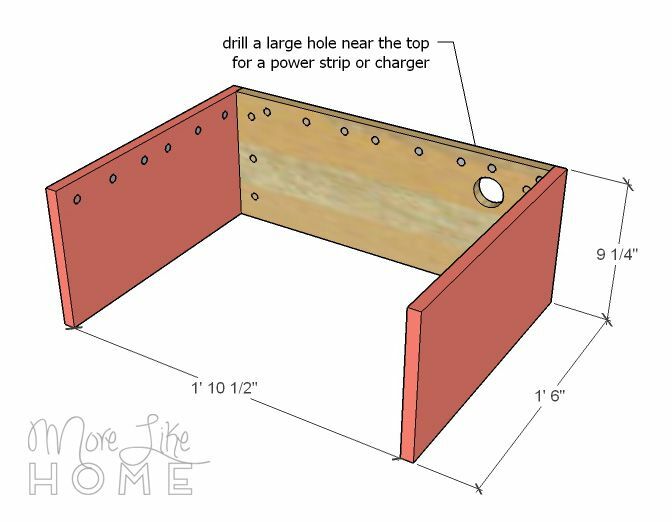 Drill pocket holes along the sides and back of the divider (on the bottom side) and attach it into the box with pocket hole screws. Or drill through the sides and back into the edges of the divider. Make sure the divider is set up 5 3/4" from the bottom board. Cut the ends of the back boards at a 5 degree angle (perpendicular /=\). Attach the top shelf back (F) between the back legs. Use pocket holes in both ends of the back board, and make sure it is set down 8 1/4" from the bottom of the box. It should be flush with the front of the legs. Or you can drill through the legs into the ends of the back board, but you'll need longer screws (at least 3") and be very careful not to split the legs! Then install the bottom shelf back (G) the same way. This board should be set down 11 1/2" from the top back board. 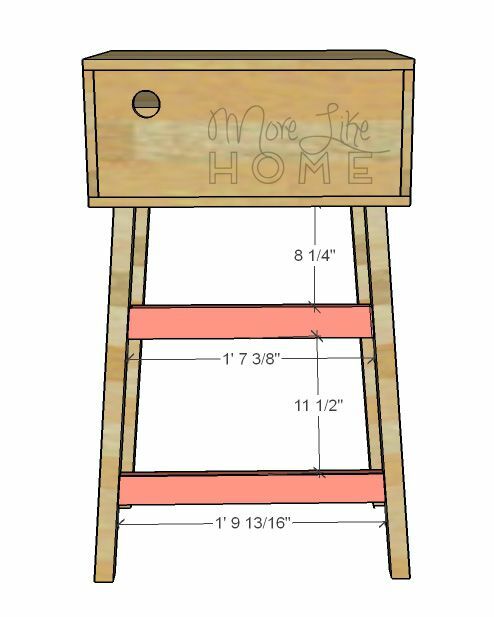 Install the top shelf (H) flush with the bottom edge of the top back board and sitting level. 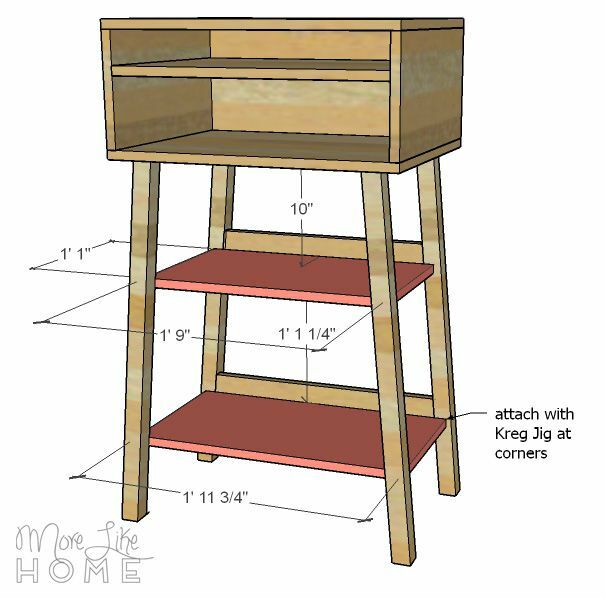 Use pocket holes in the corners of the shelf, one going into each leg, and a couple along the back. Again, you can drilling through the legs into the corners of the shelf if you don't have a Kreg Jig, but you'll have to be super careful not to split the legs or the shelf. Install the bottom shelf (I) in the same way. Make sure it is flush with the bottom of the bottom back board and sitting level. 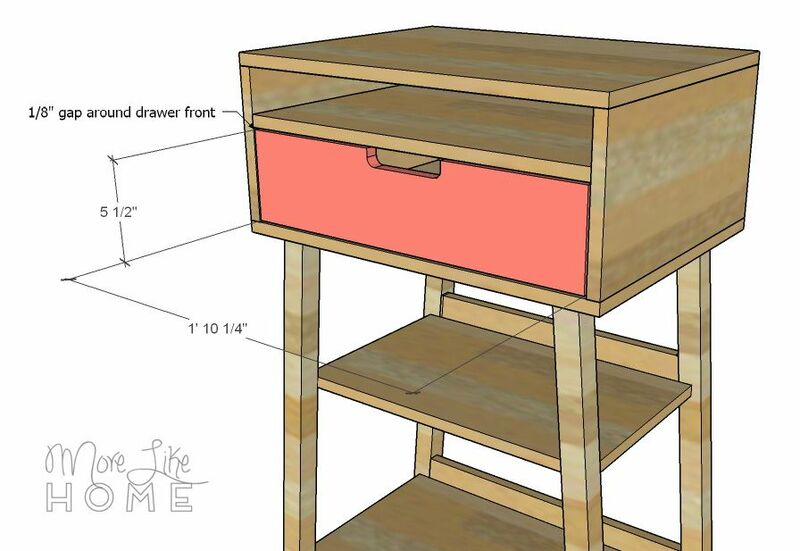 Now you can make the drawer box. 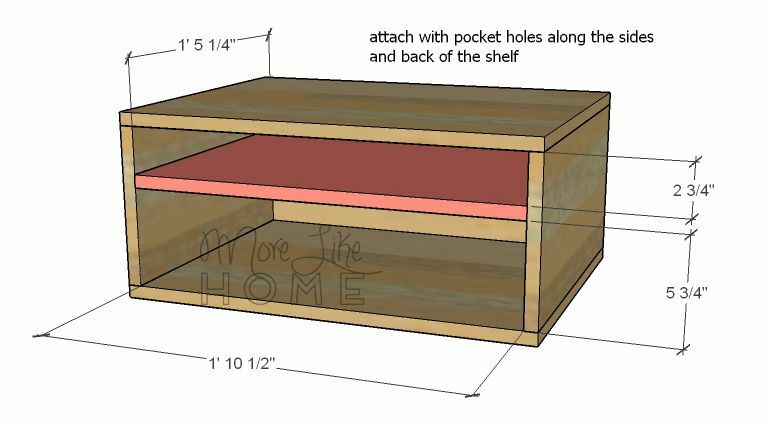 Drill pocket holes in the ends of the drawer back boards (K), then attach them to the drawer sides (J) to make a box. 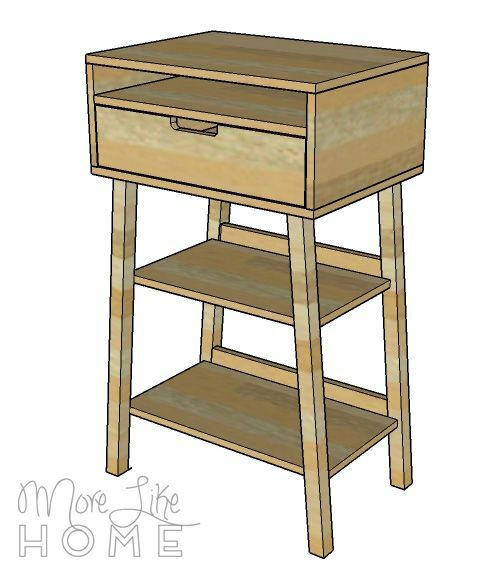 Attach the drawer bottom (L) by drilling through the bottom into all four sides of the drawer box frame with 1 1/4" wood screws. 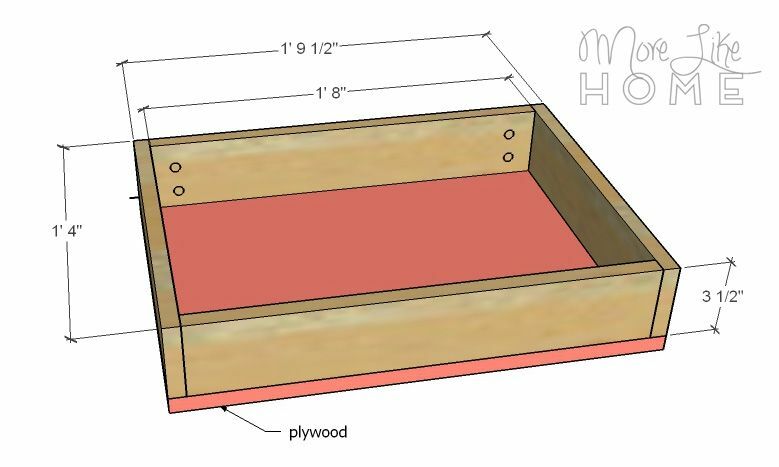 Follow the instructions on your drawer slides to install the drawer box. 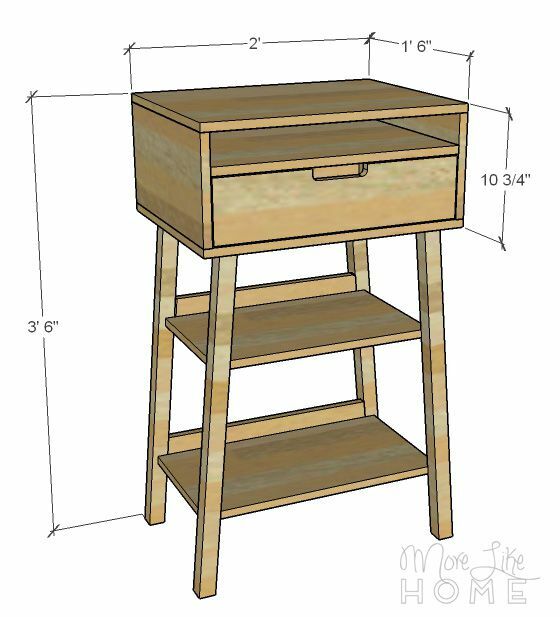 Make sure the box is inset 3/4" from the face of the desk so your drawer front will sit flush later. If you're doing a notched drawer front, make sure this box is installed low enough that it won't show through the notch. If you'd like to cut a notched pull in the drawer front (M), go ahead and do that now. 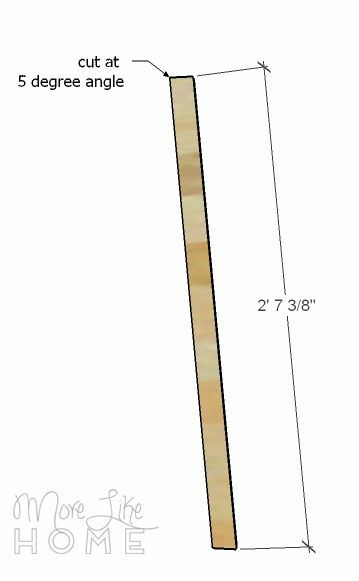 I've drawn it with a notch 5" wide and 1" deep centered with 8 5/8" on each side. You can round the corners, cut them at an angle, or make them square. If you prefer to add a drawer pull, skip this step. Center the drawer front (M) in front of the drawer box with a 1/8" gap all around. Use glue and a few finishing nails to hold it in place. Then pull the drawer out lay it face down. 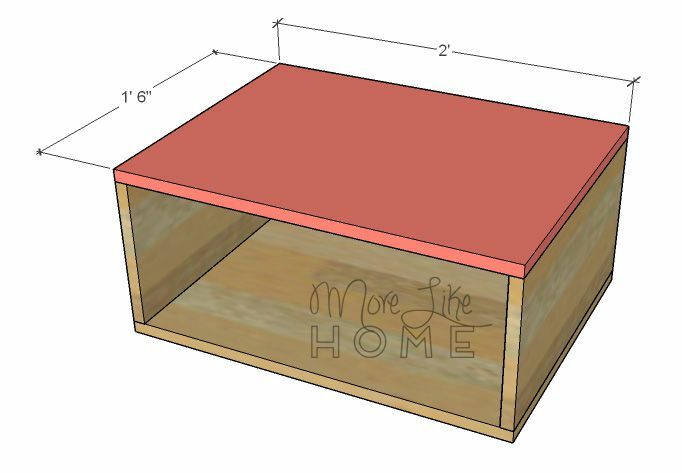 Drill down through the front of the drawer box with 1 1/4" wood screws to reinforce the drawer front. 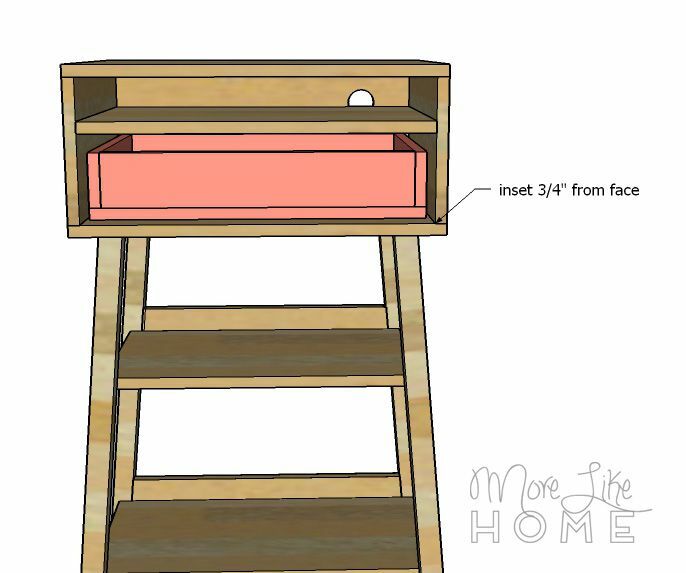 Don't countersink these too far or you will poke through the drawer front!